In the 17th and 18th centuries the Leeward Colonies of the Caribbean (islands lying parallel to the north coast of South America) were administered by a Governor in Chief or a Governor General who lived in Antigua. St. Kitts, however, was under the authority of a Lieutenant Governor who governed through a Council of 10 men (usually wealthy planters and merchants) and an Assembly of 24 men (elected by the freeholders). 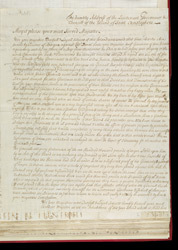 This document defends the Governor in Chief, Daniel Parke, against a letter of complaint that had been written by a Mr Nevis, ?The General's obliging forbearance of the One Hundred Thousand pounds of sugar settled upon him by an Act of this Island in not making many demand on the same after he saw and was sensible of what hardships the Hurricane had laid us under is to us a sufficient proof of his Generosity and goodness?? The authors also state that they ?have reason to Believe their complaints to be ill grounded & unjust & rather the effects of private piques by particular persons. ?